So do you remember that day at the wedding? The wedding was grand and glorious. The bridegroom and his friends made their way in procession to the bride’s house. It was in the dark of night with a spectacular torchlight procession. Then there were speeches and expressions of goodwill before the couple made their way to the groom’s house for the banquet. And then the unthinkable happened. The wine ran out. Wow, that was actually pretty embarrassing. (And there are commentators that have noted that litigation was even possible in a case like this! How odd!) Most of the guests didn’t seem to know what was happening, but Jesus’ mother was in a panic. And so she looks to her son. “Jesus, fix this!” And, miracle of miracles, he did. This has always been an odd story for me. I mean, really, wine? Why didn’t he turn the water into food for the hungry or clothing for the poor? Why didn’t he end the suffering of one of those wedding guests who were forced to live their lives in pain? Why didn’t he teach those that were there that God is more impressed by who we are than what we do? Now THAT would have been a miracle. But instead Jesus, in his first miraculous act, creates a party, a feast. Maybe it’s a reminder that we ought to just relax and trust God a little more, maybe even enjoy basking in the very Presence of God. Maybe it’s trying to tell us that God is indeed in every aspect of our life. And maybe it’s telling us that life is indeed a feast to be celebrated. And think about the wine itself. It begins as ordinary grapes. Well, not really. If you go even farther back, you start with water. Are you beginning to see that, really, everything starts with water? And then those ordinary grapes with just the right amount of water, the right amount of sunlight, and the right amount of nutrients fed to them from the rich, dark earth begin to seed. And then we wait, we wait for them to grow and flourish and at just the right time, they are picked and processed and strained of impurities and all of those things that are not necessary. And then they are bottled and tucked away while again, we wait. They are placed in just the right temperature, with just the right amount of light, and just the right amount of air quality, and we wait. We wait and until it becomes…well, a miracle. And Biblical theologians have over and over pointed to the relationship that this story has with the Eucharist. Think about it. We take ordinary bread and ordinary wine (or in our case, ordinary Welch’s Grape Juice), and through what we can only describe as a Holy Mystery, a veritable miracle, those ordinary things become holy. They become for us the body and blood of Christ, the very essence of Christ to us, for us, and in us. 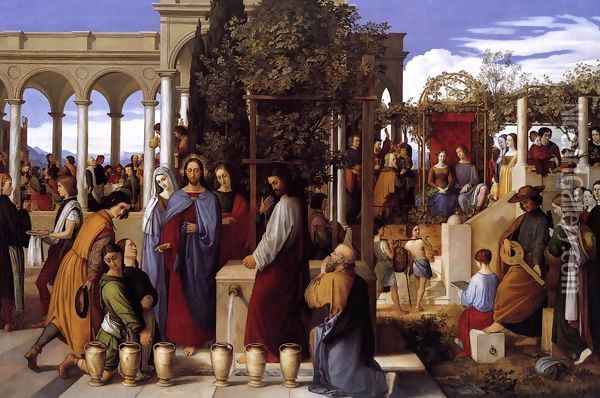 And remember that when the wine ran out, Jesus did not conjure up fresh flagons of wine. Rather, he took what was there, those ordinary, perhaps even abandoned vessels of ordinary, everyday water and turned it into a holy and sacred gift. Water and a miracle…Wine is water–plus a miracle. But in case it is lost on us, remember that our bodies are roughly two-thirds water. No wonder the ancient sages always used water as a symbol for matter itself. Humans, they taught, are a miraculous combination of matter and Spirit—water and a miracle—and thus unique in all of creation. No wonder that wine is such a powerful, sacramental, and universal symbol of the natural world—illumined and uplifted by the Divine. Wine is water, plus spirit, a unique nectar of the Divine, a symbol of life. And we, ordinary water-filled vessels though we are, are no different. God takes the created matter that is us and breathes Spirit into us, breathes life into us. We, too, are water plus a miracle. 13th century German mystic Meister Eckhart said that “every creature is a word of God.” It’s another way of reminding us that we are water plus a miracle, beloved children of God. Jerusalem is just within our reach. Our journey holds it in sight. And so to prepare for what is to come, we remember who we are. We remember that time that seems like only yesterday and also a lifetime away when Jesus showed us who we were. And thinking back to this day, thinking back to that first miracle, we realize that it’s not about wine; it’s about us. This was Jesus’ lesson in who we are. It’s a reminder that WE are the miracle–created matter, water-born and Spirit-breathed. We ARE the good wine, saved just for now. We are water plus a miracle. There are only days left in our Lenten journey, days left to gather ourselves for the Cross. Who are you? Who were you created to be? What would it mean to live your life as though you were a miracle?